B0205. LOTTE LEHMANN. Five Operas and Richard Strauss. 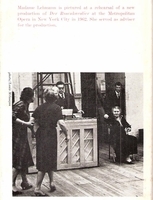 New York, Macmillan, 1964. 209pp. Index; Photos; Illus; DJ. In-depth analyses of ARIADNE, FRAU ÖHNE SCHATTEN, INTERMEZZO, ARABELLA & ROSENKAVALIER, based on her performing experience in these works. Final copy!